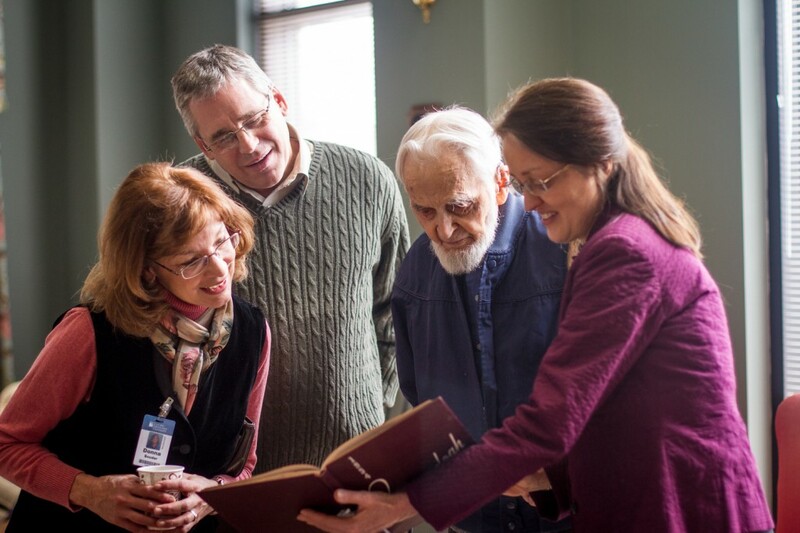 When retired church ministry professor John R. Martin welcomed his former classmate to the Eastern Mennonite University campus last week, he offered warm regards. 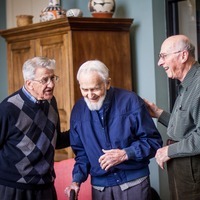 “It is an honor that you’ve come to visit us,” Martin said, clasping the hands of 98-year-old Amos J. Yoder. “Oh, don’t make too much of it,” said Yoder with a grin. Much was made of Yoder’s visit, the first time he had set foot on campus since graduating in 1954. He may be EMU’s oldest living graduate. There was a reason Yoder left campus right after commencement and crossed four states quickly heading west, according to daughter Rebecca Barbo, who lives in nearby Dayton. The couple married in June 1954 in Iowa. Yoder began a long teaching career in the midwest, the couple raised six children, and he just never managed to make it back to Virginia. Rebecca says her father always carried fond memories of his time in Harrisonburg. “He’s an intellectual, always thinking about something, so being here and having the chance to study and learn was really important to him. Last week, Yoder traveled from his home in Grove City, Minnesota, to visit Rebecca and her husband, who recently returned from nearly 20 years living overseas. Yoder and his daughter were greeted by a delegation of EMU alumni relations representatives and former classmates, including Doris A. Bomberger and her husband James ’55, Ruth L. Burkholder, Kenton K. Brubaker, and Martin. “Have you noticed anything’s changed?” asked Laban Peachey, who was dean of students in 1954 when the campus consisted of an awkward-looking “Ad Building” with mismatched additions on each end, Lehman Auditorium, the lower levels of Northlawn which was under construction, an exercise hall (now storage building) north of Northlawn, and a brick observatory on the top of a barren hill. Park Woods cabin was the student recreation area. “It’s not too familiar anymore,” Yoder remarked, smiling. 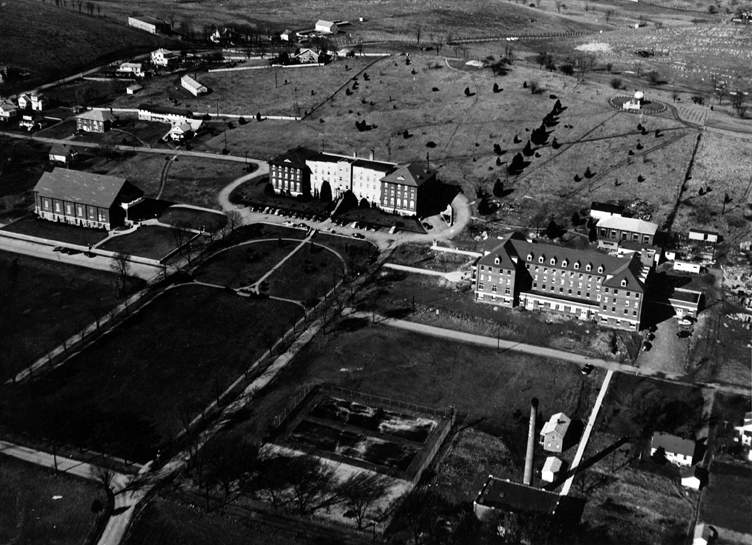 When Yoder came to what was then still Eastern Mennonite College in 1949, he was 33 years old. It wasn’t just his age that set him apart. Martin, his former classmate, says he remembers Yoder on campus because he was one of four Amish students. 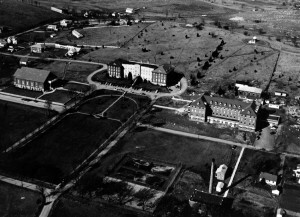 Although Yoder appears in the 1954 class photo, the Amish aversion to being photographed is reflected in the absence of his individual portrait among the senior class in Shenandoah, the college yearbook. (The 1954 class had 52 students, 48 of whom were Mennonite, including two Japanese students, Itoko Maeda and Taizo Tanimoto, and Harrisonburg native Margaret “Peggy” Webb, the first African-American graduate of EMC). Unlike most of his classmates, Yoder was also old enough to have his life completely disrupted by World War II. He was born in an Amish farming community near Weatherford, Oklahoma, and expected to live there for the rest of his life. But in 1941, at age 25 and still unmarried, Yoder was drafted. The majority of CPS participants were Mennonite and Brethren, and most of the camps were operated by agencies linked to the “peace church” tradition: Mennonite Central Committee (MCC), Brethren Service Committee and American Friends Service Committee. Yoder served in Colorado Springs for four years with two MCC-operated units attached to the Soil Conservation Service. When he was discharged in late 1945, war-torn Europe was awash with a flood of refugees. MCC purchased two large tracts of land, on which eventually settled more than 4,800 refugees within what became the Volendam and Neuland colonies. This added to the sizable population of Mennonites that had been living in Paraguay since 1928. After his service with MCC in Paraguay, having plenty of practice speaking German with refugees, Yoder arrived on campus to continue his language studies. In 1954, newly graduated and newly wed, Yoder spent 13 years teaching in Iowa in Amish schools. Rebecca, who was taught in a one-room schoolhouse by her father, says one of his professional goals was to improve and reform the Amish school system. Most teachers only had an eighth-grade education, she said, and her father brought not only pedagogical training but also life experience to the sheltered classrooms he taught in. During summers off from teaching in the Amish schools, he attended Iowa State University for five sessions and earned a master’s degree in education. Yoder and his family moved to Glacier Colony, a Hutterite community near the Canadian border, the following year, followed by a return to Amish schools in Iowa and Ohio. He retired from teaching in 1972 and moved to Minnesota, where he still resides. I came in 1953 as a freshman. I never really knew Amos but still share his feelings of EMC(U) as one of the highlights of my life and look back and feel the amazement of coming from PA to VA for college. So glad you could make the trip Amos and continued Blessings to you. What an interesting life he’s had. Amazing in so many ways. I feel blessed to have been able to read a little about it. Wow ! I love the Amish . I read Everything I can find about Their lifestyle. A Amish Man Lives at the Assisted Living Center where My Grandmother lives and I’m going there this week . Hopefully I’ll get to talk to Him. My Grand k\Kids say all the time “I think MUM is going Amish”! Because I live on a mini Farm and heat with wood and have a wood cook stove. What a way to live.